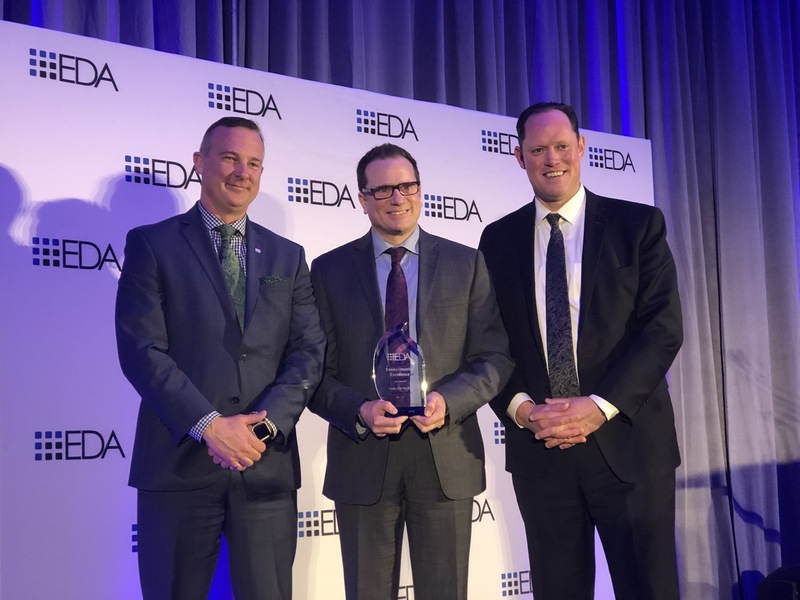 (Oakville, ON) March 29, 2019 – Oakville Hydro is proud to announce that it received the 2018 Environmental Excellence Award from the Electricity Distributors Association (EDA), recognizing the organization’s outstanding efforts in striving to protect and improve the environment. The Environmental Excellence Award is presented to a local electricity distribution company that has distinguished itself among its peers in the area of sustainability, and criteria includes environmental benefits, stewardship, economic benefit and innovation. Pictured from left to right: Scott Mudie, Chief Operating Officer, Oakville Hydro, Peter Michaud, Director, Health, Safety and Environment, Oakville Hydro, and Gerry Smallegange, CEO, Burlington Hydro and Chair of the EDA. Oakville Hydro, part of the OEC Family of Companies, delivers reliable and safe electricity to more than 70,000 individuals, families and businesses in Oakville. The company maintains an active commitment to conservation, safety, and is strongly invested in the social and economic well-being of the Oakville community. Oakville Hydro is a two-time past recipient of the Local Distribution Company Performance Excellence Award from the Electricity Distributors Association and a Canada’s Safest Employers Silver Award recipient, recognizing the organization as an exceptional leader in the industry. For more information, please visit www.oakvillehydro.com, follow us on Twitter @oakvillehydro, or visit us on Facebook at www.facebook.com/oakvillehydro. For information on power interruptions, visit www.oakvilleoutages.ca.